MatchyMatchy.io | Play MatchyMatchy.io free on iogames.space! Matchy Matchy is a twist on the classic Match-3 game: It's a one versus one Match-3 game meaning that you battle another player or the computer to complete objectives as quickly as possible. The quickest to complete all objectives wins! - If you want to win you'll have to think quickly. - Play against other players or the computer. - Full screen play on any browser size. - Cute graphics you'd expect in a Match-3 game. - Fun sounds and music that match the cute graphics. The game play can be quite addictive once you get good at matching the pieces (candies) quickly. Matchy Matchy is a one versus one Match-3 game. You play the bottom game. The opponent plays the top game. You have to beat your opponent by completing the objectives. One of the objectives is to score points that is represented by the bar at the bottom (e.g. score 200 points). The other two objectives is to match the two randomly chosen pieces (candies) the number of times indicated (e.g. 15 times). 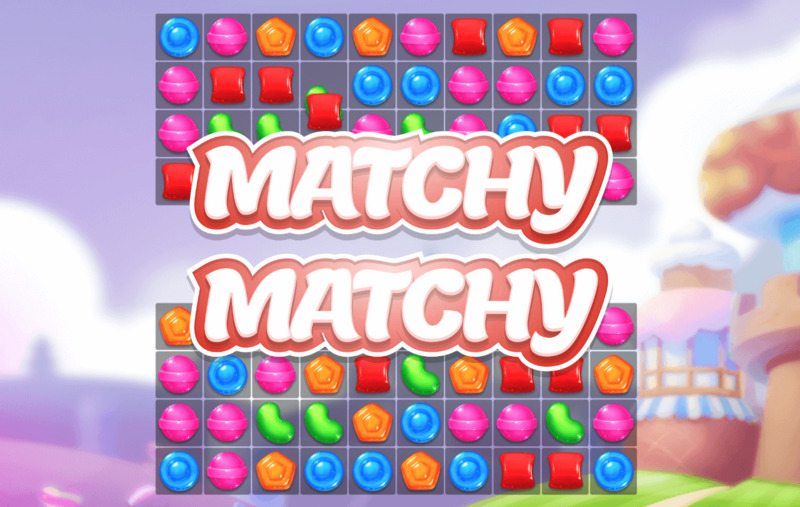 You do this by classic Match-3 game play which consists of swiping pieces (candies) to make 3, 4 or 5 in a row candies. - Focus on the objective candies first, so if you need the green and orange candies, clear them as quickly as possible. - Try and get 4 or 5 matches instead of only 3, this will give you a higher score more quickly. A match 3 gives you 10 points, match 4 gives you 25 points and match 5 gives you 50 points. - Obvious tip: make matches as quickly as possible, you should make a match in less than a second. Aways be swiping!